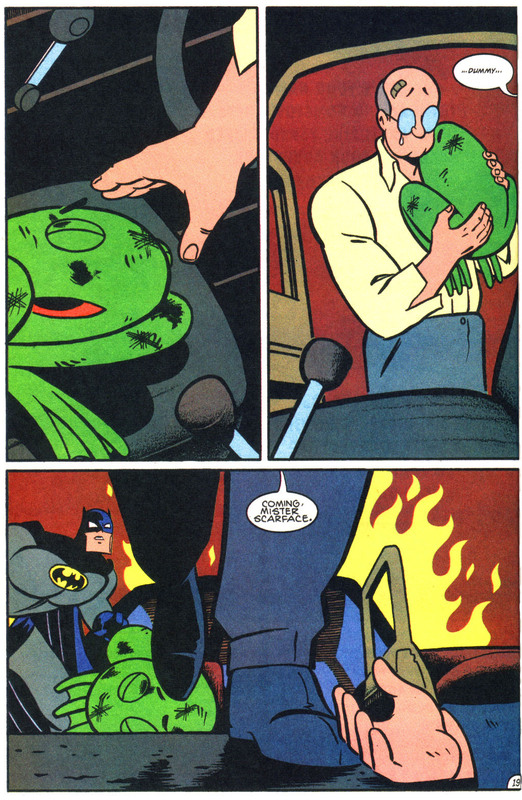 From The Batman Adventures Annual #1. 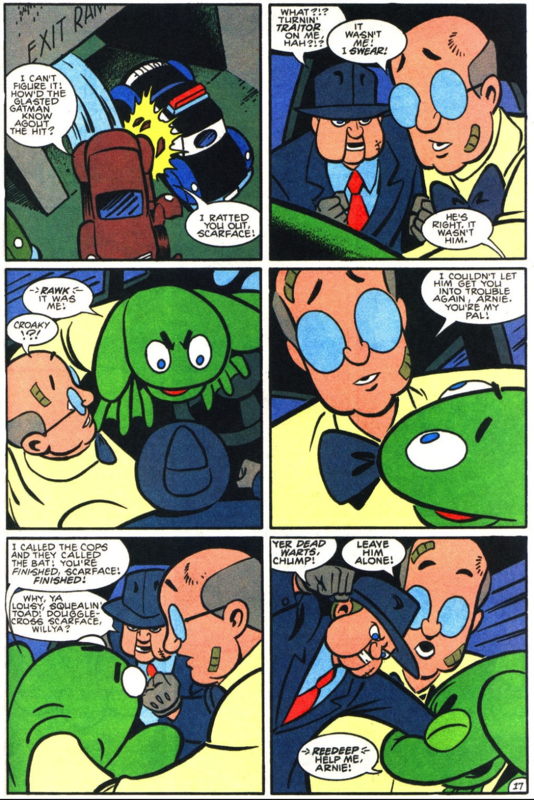 Physically and mentally separated from Scarface, a paroled Arnold Wesker joins the children's series Magic Mitzi's Fantasy Forest as operator for a frog puppet named Croaky. Soon after, the show is slated for cancellation, causing its star Mitzi Martin to develop a psychotic vendetta against its director Radford. Mitzi learns about Scarface and comes up with a plan. 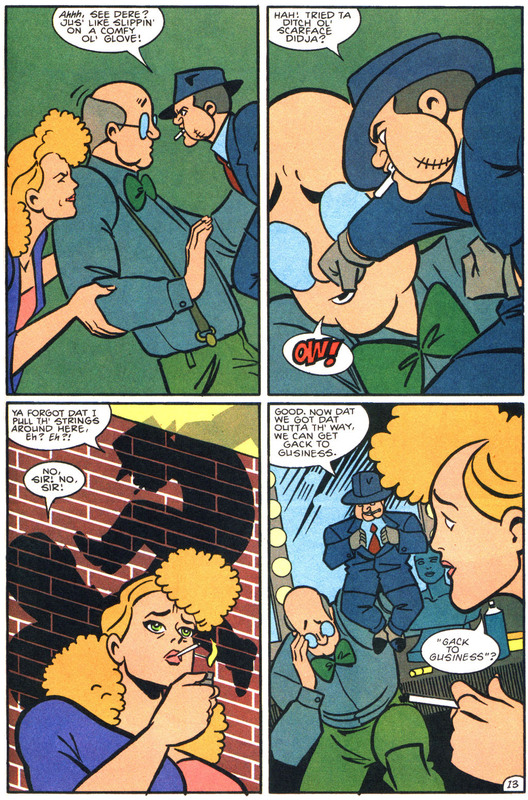 Scarface agrees to help carry out the murder with Mitzi but their attempts are foiled by Batman. Arnold loses control of both his hands and crashes the getaway car, which soon ignites. Wesker goes back to the burning car to retrieve Croaky. 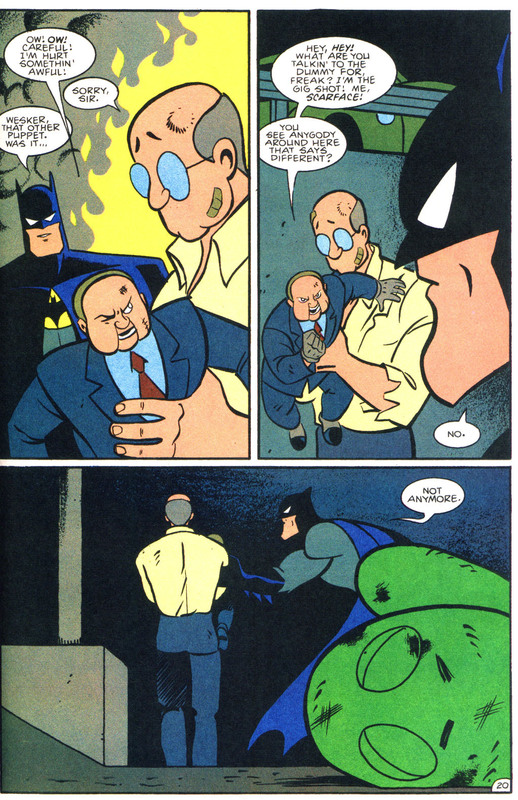 I think the cartoon "The Batman" had a similar plot in one episode, only Hugo Strange was behind Scarface's return as part of an experiment. How horribly cruel. It is an engaging story, I can see it from just these scans, but how horribly cruel to Wesker nonetheless. 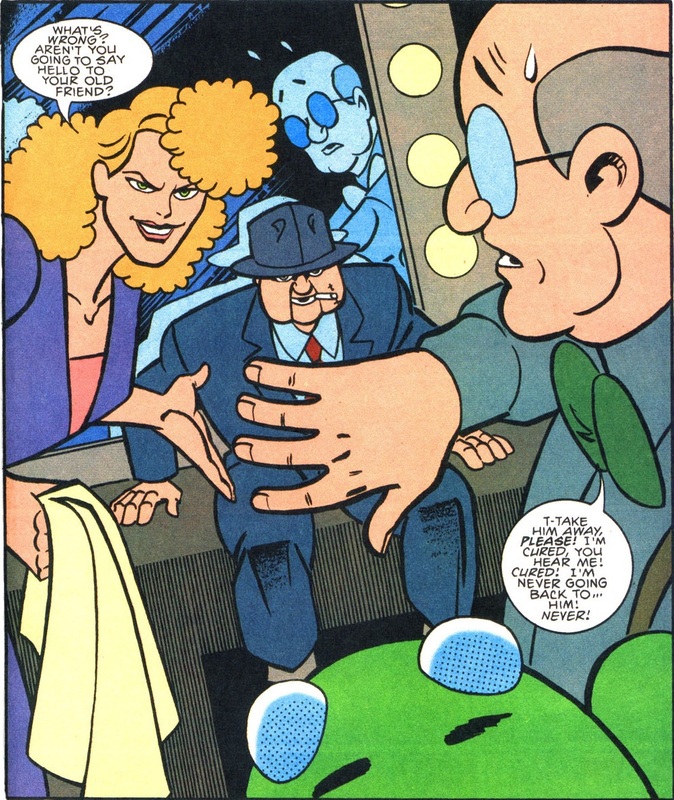 He's one of the few Batman rogues that I truly do see as almost as much a victim as the people that his psychosis kills; especially here when he is to all intents and purposes "cured" and then the subject of a deliberate campaign to reawaken his psychosis. 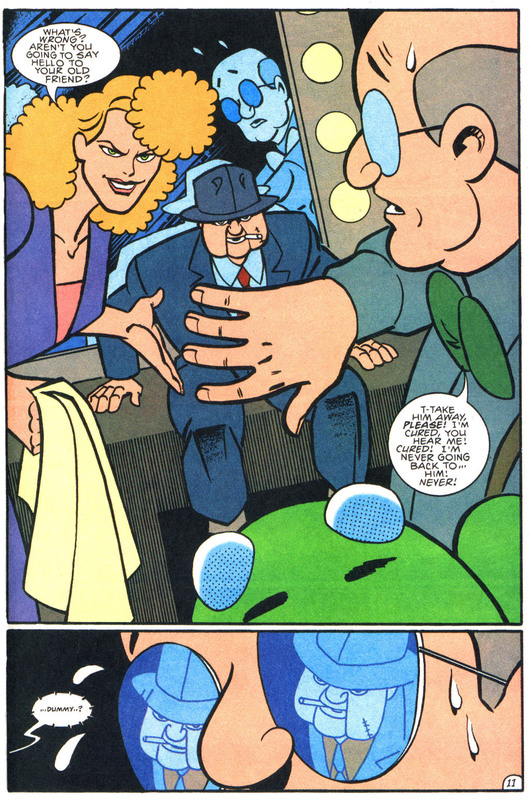 They did a similar thing to the cartoon as well: Where Wesker is cured, he gets a new life and a job at Wayne Enterprises... then Mugsy and Rhino gaslight the poor guy to reawaken Scarface. It ends more happily though as in the end Wesker finally rejects Scarface once and for all and tosses him into a wood chipper. Also, this is part of an anthology book (the one that introduced Roxie Rocket if I am not mistaken) and the other stories involve Harley (A wordless story about Harley getting released from Arkham, seduced by the Joker back to crime, then recaptured and put back in Arkham in less than a day), and a Scarecrow story (Where he escapes, goes legit and becomes a professor, until he discovers that a student he has taken a liking to was raped by one of her classmates, at which point he kidnaps the creep and begins gassing him with fear gas that makes him hallucinate being covered with various types of vermin until Batman shows up). And it all wraps up with "Laughter After Midnight" (posted just a few days ago, if I'm not mistaken), reminding us all that in the end, some crooks really do just need a solid boot to the head. 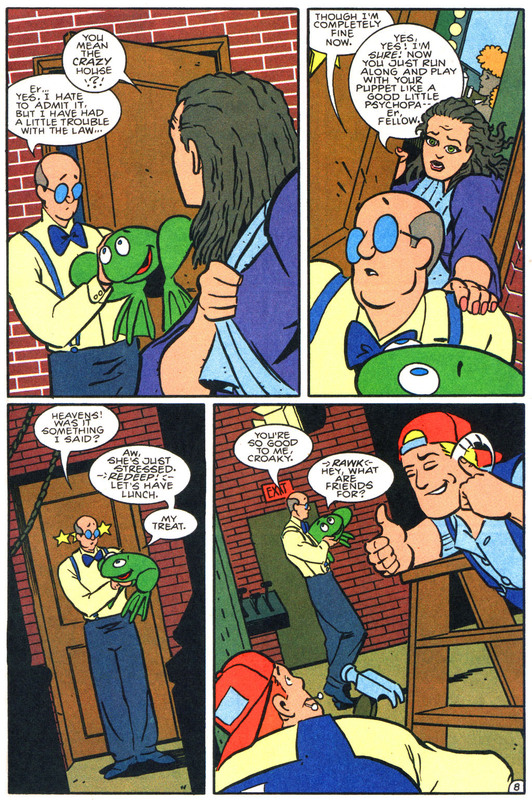 I always love it when they do stuff like this with the Ventriloquist. Always loved the TAS version of the Ventriloquist. As far as I can recall, his retool season happy ending never got undone either. It's up to you whether to regard them as canon, but at least two of the BTAS tie-in comics (Gotham Adventures #58 and Batman Adventures (the 2003 volume) #1) had him revert long after "Double Talk" aired.